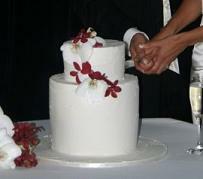 Small wedding cakes can fit in really well with many types of weddings, especially if you are having a small wedding. As you will see below, there are a few really great options available. You should have many vendors available when deciding who is going to make your small cake. Bakers and cake designers that specialize in smaller cakes will be available to you, even if they typically don't do wedding cakes. Single tier cakes are the most popular type of small cake. Many of the options available for larger cakes will apply to smaller cakes as well. You can still have fondant icing, and you can still decorate your cake with flowers or a wedding cake topper. If you still want to have a multi-tiered cake, you will have to find a baker or cake designer that offers this type of cake which may be a little challenging. You may find that the options available to you may be a little limited compared to the options for a full size cake. When you do find someone to make your small multi-tiered cake, you will find that the decoration options should be about the same as a bigger cake. You may be limited in the flavors available for your cake though. Cupcakes can be a fun option. Visit cupcake wedding cakes for more ideas. Mini cakes (sometimes referred to as individual cakes) are usually a bit hit for your guests and a lot of fun too. On your reception tables have one cake displayed for each guest at the table, and have a small cake for you to cut on your table. Just because you are having a small cake doesn't mean it has to be boring. Going with a unique cake shape can let you show your creativity, so don't be afraid to have some fun with it. This is also an opportunity to match your cake with your wedding theme. Smaller cakes are typically easier to work with when creating unique shapes. Unique shape ideas include something as simple as a square cake to something extravagant as a beach-themed or western-themed cake. You can also consider going with a flavor or type of cake that isn't a typical wedding cake. Cheese cake or a cake that matches the season of your wedding are examples.